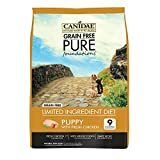 Choosing the best dog food for Pitbulls requires owners to understand this unique breed. From their nutritional needs to their health issues (e.g. allergies) to their playful, active nature as puppies, certain high-quality dry and wet dog foods are better formulated for Pitbulls. To help save you time and money, we’ve created this guide to help you figure out what to buy your canine. Below, you’ll find details on Pitbull diet and nutrition, what makes a good dog food, some recommendations of the top-rated brands for your puppy as well as food just for Pitbulls with allergies. 1.2 How Many Calories Do Pitbulls Need To Have? 1.3 How Much Protein, Fat and Carbs Do Pitbulls Need? Pitbulls today can be mixed between several different breeds, resulting in dozens cross breeds like the Pitbull Lab mix. This means that they can vary in size between about 30 and 70 pounds. Regardless of your Pitbull’s size, you can expect him to be strong, muscular, and agile. Many of these dogs are blocky or stocky in build. And Pitbulls usually like to eat so you will probably need to be careful about how much you feed your dog. Furthermore, Pitbulls with allergies are not unusual, especially skin allergies if they are white with pink skin or if they have lots of white on their body. Some Pits may also have food allergies that are expressed with skin problems. Pay attention to your dog’s behavior, including licking, scratching and unusual bowel movements, as well as irritations and rashes that may indicate a food allergy or stomach sensitivity. If you do notice these types of health issues, check your Pitbull’s food for bad ingredients like bone meal, by-products, corn, soy, wheat or other grains. Since Pitbulls tend to be allergic to grains, a hypoallergenic or grain-free dog food may be best. How Many Calories Do Pitbulls Need To Have? Adult Pitbull dogs weighing between 30 and 70 pounds can eat between 894 and 1688 calories per day. Expect your dog to eat more if he’s very active. If your dog is spayed, neutered or very inactive, he will likely need fewer calories per day. Pitbull puppies always need more calories while they are growing than adult or senior dogs. For example, a growing Pitbull puppy weighing 30 pounds would need about 1000 calories per day. How Much Protein, Fat and Carbs Do Pitbulls Need? As with other dogs, food for Pitbulls needs to have good protein. The Association of American Feed Control Officials (AAFCO) recommends a minimum of 22% protein for growth and reproduction (puppies, pregnant and nursing mothers); and 18% protein for an adult maintaining her weight. Virtually all good dog foods exceed these recommendations. Dogs also require fat in their diet. AAFCO recommends 8% fat for growth and reproduction; and 5% fat for an adult maintenance diet. Again, nearly all quality dog food brands today have more fat than this on a dry matter basis. Ultimately, you’ll want to buy a dog food made of the healthiest sources of protein, fats and carbs. Pitbulls usually have a good appetite so you probably won’t have to beg your dog to eat. For Pitbull puppies, we recommend feeding 3 to 4 small meals for the first few weeks after weaning. Soon thereafter, you can feed your puppy 3 meals per day. By the time your puppy is a year old, he should be eating two meals per day and you can switch him to a full adult diet. We recommend feeding adult Pitbulls two meals per day. Bloat can occur in Pitbulls but it’s not a common problem. If you are more comfortable dividing your Pitbull’s food up in more than two meals so he can eat smaller amounts at each meal, that would be acceptable. We would not recommend feeding just one meal per day. We do suggest that you don’t free feed your dog. Put your dog’s food down for 30 minutes. This should give your Pitbull plenty of time to eat all he wants. Then remove the bowl or dish. Dogs that are free fed are much more likely to become overweight or obese, which can lead to serious health problems. Officially, the term “Pitbull” can refer to several different breeds or crosses. Breeds that are often considered to be “bully” breeds are the Staffordshire Bull Terrier, American Staffordshire Terrier, and American Pit Bull Terrier. All of these breeds have been inter-related in the past. They have the same ancestry as modern Pitbulls. Similarly, Pitbulls can have some of the same health issues found in any of these breeds. In addition to food and skin allergies, some Pitbulls, especially larger dogs, may have problems with hip dysplasia and other joint problems. If you have a very large Pitbull, you may want to feed a large breed dog food that includes joint supplements such as glucosamine and chondroitin. Or add these supplements to your dog’s food. Other joint supplements include SAMe and green mussels. While every dog is an individual and Pitbulls have some health issues to watch for, there are some things that good dog foods have in common. Here’s what to watch for when buying the best dog food for your Pitbull. We’ve already mentioned that food for Pitbull adults should have a minimum of 18% protein (by dry matter basis). Fortunately, most good dog foods have more protein than that, and because Pitbulls are such a muscular breed, we recommend a higher protein content of 25% to 30%. And if you have a particularly active dog that requires muscle growth and development, than you can increase the amount of protein a bit more. However, you do need to check the ingredients to see the sources of the protein. Ideally the healthiest dog food will have several sources of animal protein in the first few ingredients. Dogs are able to digest animal protein more easily than plant protein. Look for animal proteins like chicken, beef, duck, salmon, eggs, and fish. This is true for all of the ingredients in the food but it’s especially important for animal ingredients. “Meat meal” is a vague, generic ingredient that you should avoid. “Chicken meal” can be a good ingredient with lots of protein from a named source. Ideally, chicken meal will accompany whole chicken to add more protein to the food. You should be aware that whole meats, like whole chicken, are great but they are mostly water which evaporates during the cooking process, leaving a relatively small amount of protein and other nutrients. Likewise, chicken fat is better than animal fat. This is not as easy as it sounds, even if you buy a grain-free dog food. Many grain-free products use potatoes, sweet potatoes, and other vegetables as grain substitutes that can be very high in carbs. Some of these foods have just as many carbohydrates as dog foods that contain corn, wheat and soy. Unfortunately, dog food companies are not required to list the carbohydrates in their food. When possible, we suggest that you figure the carbs in any food you are considering or find them online. In some cases, low or ancestral grain formulas can have fewer carbs than some other foods. Many grain-free foods today use peas and lentils as a substitute for grains. Legumes have more protein than corn and they provide lots of vitamins and minerals, as well as some fiber. However, some dogs have problems digesting them. They have also become so common that some dogs have started developing allergies to peas. It’s also important to remember that legumes in dog food are used to boost the protein percentage. They are a primary source of plant protein in foods. So, if the dog food has 38% protein, you need to recognize that some of the protein comes from legumes, so the nutrients are not as bioavailable to your dog. Your Pitbull could be better off with a food that has a lower amount of protein if all of the protein comes from good animal sources. These ingredients include artificial colors and dyes, preservatives, flavors, and sweeteners. Look for brands that don’t use these ingredients, some of which can trigger allergies in Pitbulls. Things can get murky with some of these terms. “Organic” is a real term and there are regulations for organic labeling. The FDA is still wrestling with the term “Natural” so ignore this term as it is simply marketing for now. “Holistic” can mean anything pet food manufacturers want it to mean. “Human” grade has a long history with pet food manufacturer. Basically, if a company wants to claim that their dog food is edible for humans, then everything from the ingredients to the facility that makes the food must pass inspection for making human food. Expect to pay much more for these foods. Know your budget and decide if you can or should pay for some of these foods. AAFCO does not conduct food testing but they provide guidelines for companies to meet. These are minimum requirements and not a guarantee of quality. Foods can be approved for all life stages, growth and reproduction, or adult maintenance. Some products are also approved for intermittent feeding (e.g. supplemental) but they should not be fed as a regular diet. Two of the best dog food brands for Pitbulls are Orijen and Fromm. Both companies use the highest-quality ingredients to make tasty food for all dogs, from puppies to older canines. However, given that these product are more expensive than most owners can comfortably afford each month, we made a point to recommend other good dog foods that are more affordable. 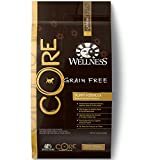 Wellness CORE dog foods are grain-free and high in meat protein. This formula has lots of omega fatty acids that are good for your Pitbull’s skin and coat. Fiber and probiotics help his digestion and glucosamine and chondroitin support joint health. Good protein helps build lean body mass. No corn, wheat, or soy. With 34% crude protein, 16% crude fat, and 421 kcal/cup, this product is one of the best dog foods for adult Pitbulls. 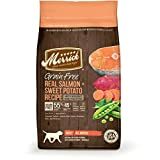 Merrick’s grain-free dog food with real salmon and sweet potato is another high-quality protein product made with real ingredients. For starters, the mix offers 34% crude protein, 14% crude fat, and 354 kcal/cup. Moreover, salmon is loaded with omega-3 fatty acids that are good for your dog’s skin and coat, giving it a beautiful shine. However, the more popular choice is the real buffalo option, which owners can pick if they want. Many pet owners choose Merrick’s grain-free formula (no corn, wheat, or soy) as a natural choice for Pitbulls who may have skin allergies. Lastly, it also has added glucosamine and chondroitin as joint supplements, and 55 % of the ingredients are fish and fat from salmon. Canidae makes lots of good foods, including many grain-free dog formulas with ingredients limited to only the best. Almost all of their products are good enough for Pitbulls, and dogs with sensitive stomachs will appreciate the whole food ingredients that aid in gentle digestion. This food has seven ingredients besides the added vitamins and minerals, and comes with no corn, wheat, or soy fillers. It has 25% crude protein, 15% crude fat, and provides 474 kcal/cup. Fresh bison is the first ingredient, a taste your Pit will love. 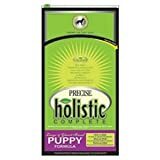 Here are the best dog foods for Pitbull puppies that will support healthy growth and development. 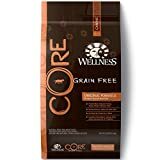 Like the other Wellness CORE foods, this grain-free puppy formula is based on the philosophy that dogs thrive when they eat a meat-based diet. As a dog food designed for Pitbull puppies, this formula is high in meat protein and contains DHA (Docosahexaenoic Acid) to help with puppy brain and eye development. It also has a good ratio of calcium to phosphorus for good bone development. Lastly, with 36% crude protein, 17.5% crude fat, and 417 kcal/cup, this dog food is AAFCO-approved for growth and gestation/lactation, particularly for large size dog breeds. 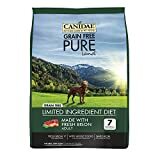 This grain-free formula by Canidae offers fresh chicken as the first ingredient. It’s a limited ingredient diet with just nine ingredients other than the vitamins and minerals. It’s suitable for puppies who may have stomach sensitives or digestion problems as well as allergies. However, the food works just as well for pups who don’t. Because it’s a grain-free formula, expect no corn, wheat, or soy. At 520 kcal/cup, it’s packed with calories and nutrient-dense. Added DHA helps with puppy brain development. And with 30% crude protein and 12% crude fat, this recipe can help puppies grow big and strong while giving them the energy to be active and fit. If you have a very large Pitbull puppy or you have reason to believe that your puppy will grow to be more than 50 pounds as an adult, we recommend that you consider feeding her a food formulated for large breed puppies. Precise is known for making very good foods for large and giant breeds – adults and puppies. Large breed puppies need slightly fewer calories and other, different nutrients while they grow to encourage slow growth. This formula contains chicken, lamb, and salmon as animal protein. And with 23% crude protein, 12% crude fat, and 400 kcal/cup, this is a great dog food for a Pitbull puppy who will grow to be large. Some Pitbulls with allergies, particularly skin allergies, may have trouble eating certain wet and dry dog foods. To avoid food or skin allergies, you may want to try feeding a grain-free dog food since some grains are considered allergens. Corn, wheat, and soy are common culprits. You may also need to avoid certain meat proteins if you know what triggers your dog’s allergies. Here’s a good dog food specifically made for Pitbulls with different types of allergies. Zignature is well-known for making many good, limited ingredient dog foods with exotic proteins. These foods are especially good for dogs that have food allergies – Pitbulls that can’t eat some of the common dog foods containing chicken and beef, for example. We like this trout and salmon formula but you could also choose a Zignature formula with kangaroo, venison, duck, lamb, or another meat protein. This food is also potato-free and the meat is hypoallergenic. Zignature’s foods have no corn, wheat, soy, dairy, chicken, chicken eggs, or chicken by-products. This dog food is gluten-free and low-glycemic. Zignature is highly recommended for any dog with allergies.